Greek Orthodox weddings are very traditional and interesting to be a part of. When walking into the grand cathedral where the ceremony is held, you will immediately sense the importance of culture and tradition that goes along with these formal services. There are many symbolic customs that occur throughout the ceremony’s events. For example, they begin with the joining of hands, where the priest joins the right hands of the bride and groom, which symbolizes the union of the couple through The Lord. Another important custom is the crowning, where two crowns are placed upon the future newlywed’s heads after a blessing, followed by chanting and a reading of scripture. A few more parts of the service are the common cup, the procession, and finally the removal of the crowns and benediction, when the bride and groom are officially declared husband and wife and depart from the church. One of the finest components of a Greek Orthodox wedding ceremony is the location at which it is held. The cathedrals are truly magnificent with unique architecture and striking artwork on the inner walls. 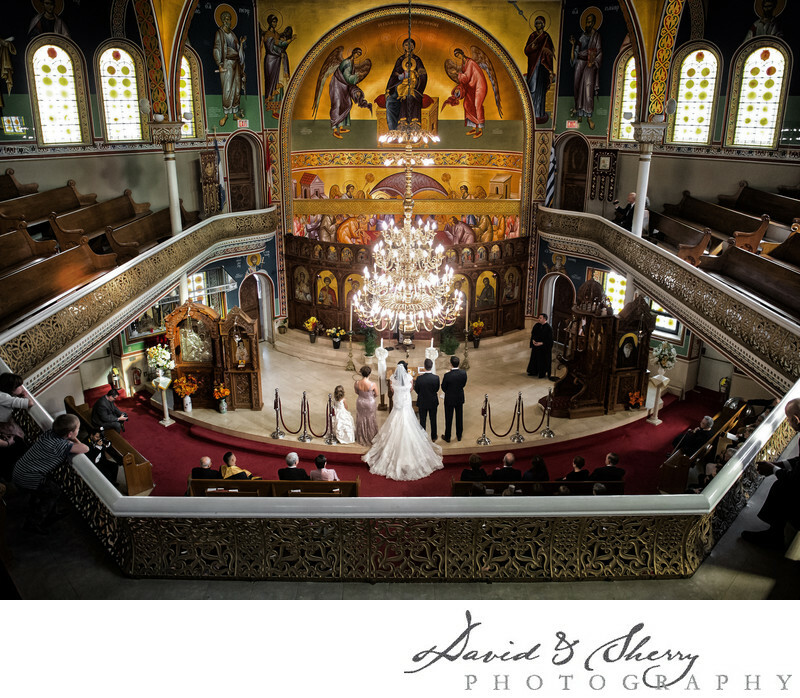 This photo was shot at St. George’s Greek Orthodox Church in Toronto, Ontario, overlooking the soon-to-be-married couple as they exchange vows in front of their guests.